Corpse Flower omits a “foul odor of rotting animal flesh” and only blooms for a few days every 7-10 years, according to the Conservatory. This year’s flower, Suma the Titan, is a 10-year-old sibling of last year’s flower Terra the Titan and it will bloom for the first time. The Conservatory of Flowers has extended its hours from 10 a.m. to 10 p.m. through Wednesday. “Oooh, that smell. Can’t you smell that smell? 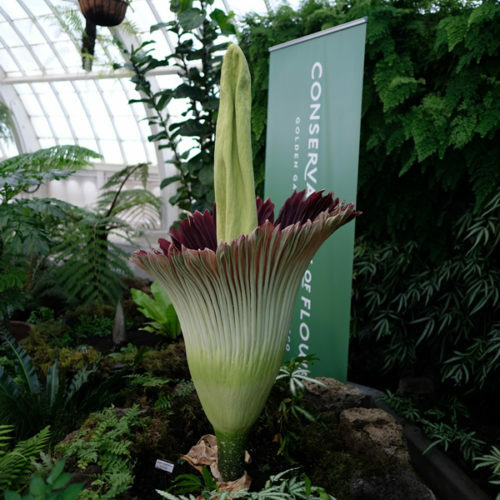 Soon, many in San Francisco will be able to smell the pungent yet popular bloom of the Corpse Flower, which began to open Sunday at the Conservatory of Flowers in Golden Gate Park, according to a conservatory spokesperson. When Suma the Titan, an Amorphophallus titanum commonly known as Corpse Flower, reaches its peak bloom, it is accompanied with a foul smell in the evenings. The bloom will last for only 2-3 days, the conservatory said. The scent is a deception device that tricks pollinators into thinking the plant is rotting organic matter, or as some describe it, rotting flesh, the conservatory said. For tickets and more information, visit www.conservatoryofflowers.org. ‘Back in the 1960s, when Armando Bernasconi first walked past the three sparkling blue pools tucked away in Golden Gate Park, he thought he had found a swimming spot that just never had any swimmers. But Bernasconi soon discovered that the artificial ponds were a training ground for master anglers seeking to refine their fly-fishing and casting skills. And since he retired at age 62, Bernasconi, now 95, has been almost a daily presence at the casting pools.“ Even when I go out to fish, I still come here every day,” said Bernasconi, who had stopped his daily ritual a few months ago because of illness. On Saturday, Bernasconi found his way back to the casting pools and the Anglers Lodge as the Golden Gate Angling and Casting Club celebrated two concurrent anniversaries — 80 years since the facilities were built and 85 years since the club was formed. When the club was founded in 1933, members had a lodge on the park’s Stow Lake. But in 1938, some of the anglers heard of a Portland, Ore., group that persuaded the Works Progress Administration, tasked with creating jobs through infrastructure projects during the Great Depression, to fund casting ponds up in Oregon.The club persuaded Golden Gate Park directors and the WPA to sponsor a similar project, and in 1939, the first national casting tournament was held at the newly constructed Angler’s Lodge. In addition to its monthly casting lessons, the club’s outreach includes organized outings to fishing spots, a program for disabled veterans, and various classes in tying flies and building rods. Larry Kenney, a longtime club member and San Francisco native, said the group has expanded its outreach efforts in recent years and seen its membership both grow and diversify. In the past three or four years, Kenney said, the club has gone from 350 members to more than 1,000. “It used to be a bunch of curmudgeonly old men, but it’s a lot more open now,” Kenney said, adding that the falling cost of fishing equipment as technology has improved has made the sport more accessible. If New York can do it, surely we can too!! ‘The campaign for a car-free park has lasted more than half century and involved thousands of people. Today’s historic announcement by Mayor de Blasio belongs to all of them. Central Park will go car-free forever on June 27, Mayor de Blasio announced today, the culmination of a campaign that has spanned seven mayoralties and more than 50 years. 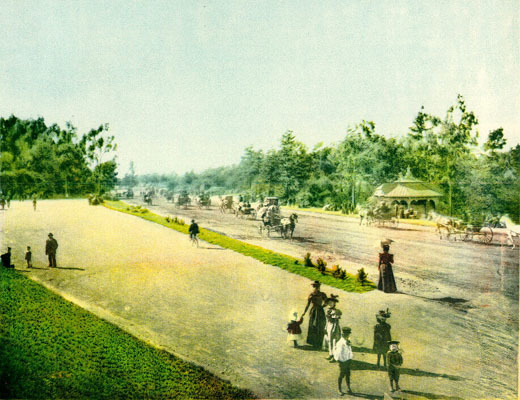 Central Park predates the automotive era, but as cars proliferated in the city, the oasis of the park became a shortcut for motor vehicle traffic. Motorists had unfettered access to the park’s loop roads until the 1960s, when activists first prevailed on City Hall to begin limiting the presence of automobiles. . . . The campaign for a car-free Central Park has taken generations to reach this point. No one has worked harder for it than Ken Coughlin, the leading advocate for more than two decades. A recent study, published in the London Evening Standard last week, compared 12 iconic urban parks in the world in terms of the value of the real estate they occupy. The results: Golden Gate Park in San Francisco is the most expensive urban green space in the world. It is worth more than $49 billion. The study calculated values by multiplying the size of the park by the average apartment value per sq/m in the city. Central Park in New York, which is smaller than Golden Gate Park, is worth more than $45 billion based on New York property prices. Obviously the cultural capital enjoyed by these parks outweighs their monetary value. Let’s hope that doesn’t change! In the past I’ve written on this blog about coyotes in Golden Gate Park, and Janet Kessler’s wonderful photographs of urban coyotes. Now I’d like to give a shout-out to an exhibit of her photographs opening this Sunday at the Sausalito Library. Not to be missed! In Janet’s own words . . . .
“Coyotes are social and, except for some transients, live in families. The 28 large 24”x16” zoomed-in snapshots in this exhibit show some of their less-seen behaviors and interactions, as well as their individuality: each coyote looks different, and the differences reach deeper than their fur. Short howling and hunting video clips are included. An explanation of a few relevant survival behaviors and some simple guidelines help round out “the picture” of these neighbors who are becoming a more visible part of the urban landscape. Place: Sausalito Public Library, located in the City Hall building at 420 Litho Street in Sausalito Enter parking lot from Bee Street (off Caledonia Street). The sprawling lawns of Golden Gate Park and two major San Francisco golf courses are very thirsty places, and in the coming years, recycled wastewater will satisfy that thirst, thanks to a new treatment plant being built by the city’s water agency. On Wednesday, the San Francisco Public Utilities Commission will begin construction on the plant that, when completed, will pump around 1.6 million gallons of treated wastewater each day to sprinklers dotting Golden Gate Park, Lincoln Park Golf Course and the Presidio Golf Course.